*** Please note that this is NOT an all inclusive list. 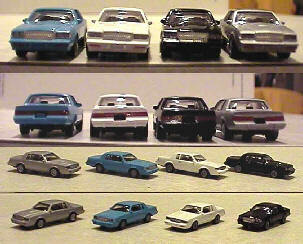 If you’re looking for 1:18 / 1:24 / 1:64 scale diecast turbo-Regals or GS/GSXs, e-mail us. Hurry! Only one set left!!! Hi-Per Products and Buick Collectibles.com is not affiliated with Buick Motor Division, or General Motors Corporation. • Provide your name and full postal mailing address. For foreign orders, please e-mail us. full name as it appears on the card, card number, and expiration date. unless otherwise arranged in advance. • We recommend checking with us on an item’s availability prior to ordering. • Please e-mail us the item part number, item description, your zip code & your e-mail address. • If a product is damaged during shipment, please be sure to contact us first. • For any other returns, contact us for a Return Merchandise Authorization Number (RMA) before returning the product. • All product must be returned in an undamaged, resalable condition. • There is a 15% restocking fee for all returned merchandise. • Shipping is not refundable.